"Behold, I have given him for a witness to the people, a leader and commander to the people." Hyrum Smith was born on February 9, 1800, in Tunbridge, Vermont. Hyrum was the third son born to Joseph Smith, Sr., and Lucy Mack Smith. (Their first son died in childbirth. Their 2nd son, Alvin was born in 1798 but died at 25). By the time he was ten-years-old his family moved to eight different locations along the Connecticut River while Joseph, Sr., struggled financially as a farmer, a storekeeper and a tenant farmer. Family always came first for Hyrum. When he was thirteen he returned home from Moor's Charity School to care for his sick younger brothers, including Joseph Smith, Jr. who had just had leg surgery. The Smith family eventually moved to upstate, New York, and settled on a farm. The family was very poor at this time so to help support the family Hyrum and his brothers worked as hired hands in addition to the work they did clearing their own land for planting and farming. During this time, Hyrum met Jerusha Barden. She was born on February 15, 1805, in Norfolk, Connecticut. They would marry on November 2, 1826. Hyrum married Jerusha Barden. Together they had six children, two of which died in childhood. They had been married for 11 years when Jerusha died after complications from giving birth to their daughter, Sarah, eleven days prior. In 1828 and 1829, Hyrum would travel to Harmony, Pennsylvania, to visit his brother, Joseph. By this time Joseph had received the golden plates from the angel, Moroni. Hyrum wanted to see how the work was progressing. During his trip in June 1829, Hyrum was baptized in Seneca Lake, New York, and was chosen to be one of the Eight Witnesses to see and handle the plates. After the translated manuscript was completed he accompanied Oliver Cowdery each day to Grandin’s Printing Shop in Palmyra to ensure the pages and Oliver arrived safe. Hyrum was among the original six members of the church when it was organized in the Peter Whitmer home on April 6, 1830. Hyrum was also one of the first missionaries of the Church, preaching in surrounding communities in New York. He baptized some of the earliest converts. Hyrum was a very active participant in building up and defending the Church. In 1831, Hyrum Smith and his family moved with the Church members, to Kirtland, Ohio. Between 1831 and 1833 he served three missions to Missouri and Ohio. In 1834, he helped to recruit members for Zion's Camp to help protect church members in Missouri. Hyrum was also the foreman of the stone quarry during the construction of the Kirtland Temple. 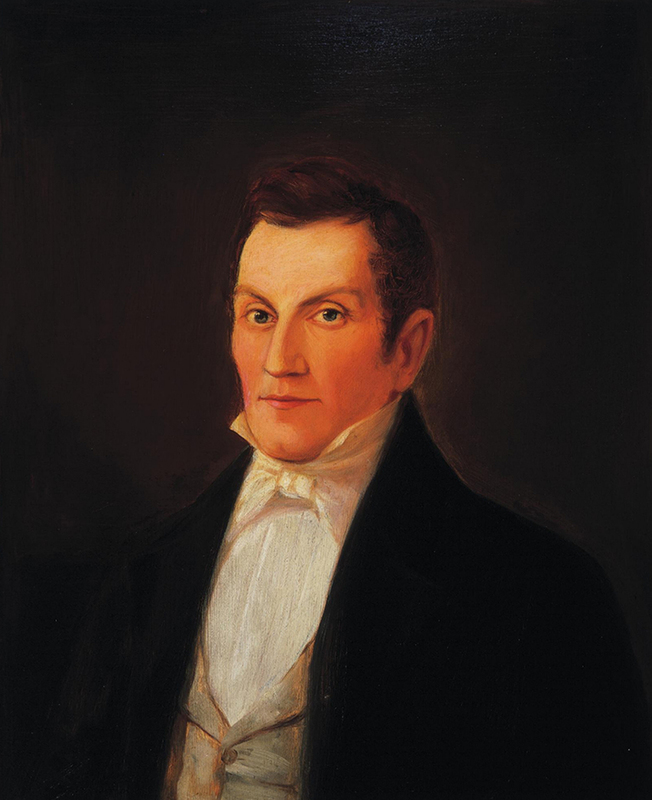 Because of his faith he was called and ordained to serve in several leadership positions during the Kirtland era, including Assistant President of the Church in December 1834, and later, in 1837, he was ordained Second Counselor in the First Presidency with Joseph Smith and Sidney Rigdon, and with Oliver Cowdery as Associate President. It was also during this time in Kirtland, that his beloved wife, Jerusha, died. In 1837, he married Mary Fielding Smith, who was born on July 21, 1801, in Bedfordshire, England. She would help rear the children he had with Jerusha. They had one son together, Joseph F. Smith, whom would grow up to be the sixth president of the LDS Church. After persecution became untenable in Ohio, Hyrum and his family followed Joseph and the other church members to settle in Missouri. During the mob violence and persecution during the Missouri Period, Hyrum, Sidney Rigdon, Joseph and several other Mormons leaders were arrested on false charges of treason, murder, arson, and stealing. They were taken to Richmond, Missouri, for trial, while the rest of the church members were violently driven out of Missouri to Illinois. After a preliminary hearing in November, Joseph and Hyrum were bound over for trial. For nearly five more months, they and three others shared a jail cell in the village of Liberty, Missouri, while state officials deliberated on their fate. On April 16, 1839, during a second change of venue, they were allowed to escape. 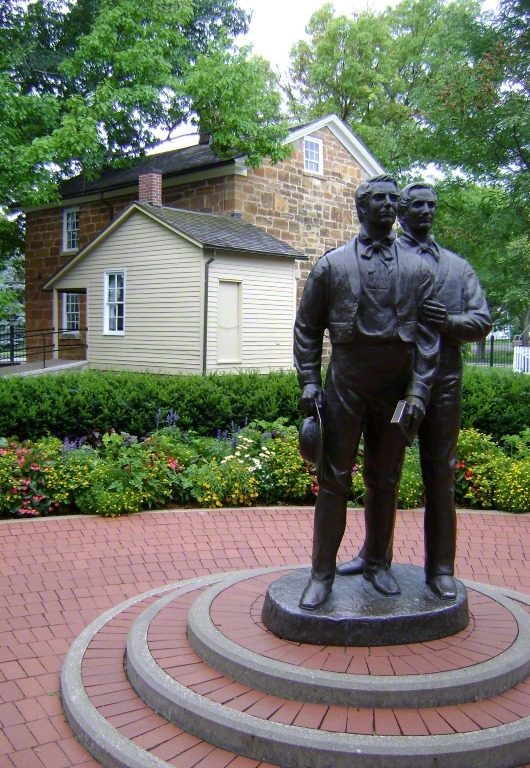 After the church settled and built the town of Nauvoo, Illinois, Hyrum continued to work by Joseph’s side. After the death of his father, Joseph Sr., Hyrum was ordained as the Presiding Patriarch of the church. He was also ordained Associate President of the Church. He was also the chairman of the Nauvoo Temple Building Committee. Most of all he had the love and respect of church members. When Joseph was arrested after the destruction of the Nauvoo Expositer printing press, Hyrum accompanied Joseph to Carthage Jail and found himself also arrested and charged with riot and treason. On June 27, 1844, when the Illinois Militia and mob stormed the jail, Hyrum was shot through the face and killed when gun fire penetrated the wooden door he was trying to push closed. Joseph was shot to death minutes later. The two brothers died martyrs, sealing their testimony with their blood. It was written of them after that "in life they were not divided, and in death they were not separated" (D&C 135:3). He was 44-years-old. In December 1839, Hyrum Smith had sent a letter to the still-scattered Saints, exiled from their homes in Missouri under the infamous "Extermination Order" of Governor Lilburn W. Boggs. In it, he recounted some of his own sufferings in captivity at Liberty Jail, where his life was several times in direct danger and bore witness, once more, to seeing and handling the golden plates of the Book of Mormon. "I thank God that I felt a determination to die, rather than deny the things which my eyes had seen, which my hands had handled, and which I had borne testimony to . . .; and I can assure my beloved brethren that I was enabled to bear as strong a testimony, when nothing but death presented itself, as ever I did in my life."